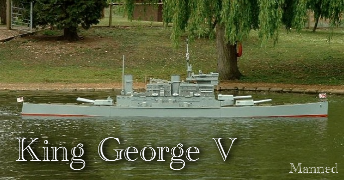 The idea of having a model boat that one could sit in has been in my head since childhood times but was given serious consideration after a visit, back in 1991, to the naval warfare battles re enacted on Peasholm Park lake in Scarborough. 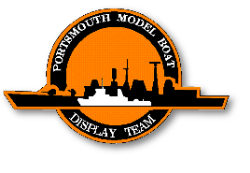 It was at the International Festival of The Sea held at Portsmouth in 2001 that I saw for the first time the two magnificent sit-in models of Roger Wilkinson. 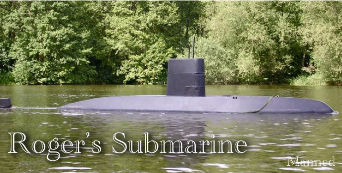 They are the 23-foot battleship King George V and a 16-foot nuclear submarine. Meeting Roger and seeing his models was the impetus that I needed to stop thinking and get building. 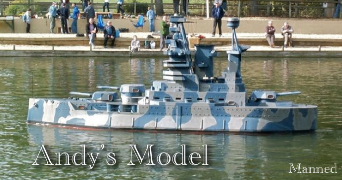 The first stage was to prove the feasibility of my smaller model so a full size cardboard mock up was quickly made, the opportunity being also taken to evaluate the envisaged paint scheme. The mock up was duly made and with little refinement, was a great success. Propulsion is by a Minkota electric outboard motor fitted in a well aft, access being from the deck and which is closed off by a plywood hatch disguised as part of the deck. Power to the motor is provided by a car type battery which sits between the crew lying down in the boat. To monitor battery performance both an ammeter and voltmeter are fitted. Motor speed is achieved by using the original controls modified from twist grip type to a simple knob. Steering is effected by a simple disc and rope arrangement operating through pulley blocks. 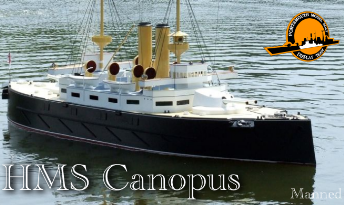 By October of 2002 after six months work HMS Canopus, as now named, was ready for launching. With the design being well thought out, especially with the help of the cardboard mock up, everything worked well even to floating to her marks. 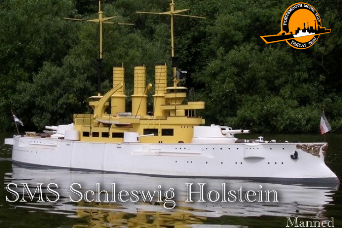 A second model, that of the Imperial German Navy’s SMS Schleswig-Holstein of similar vintage to HMS Canopus, was then built in 2004 to form a working display routine with HMS Canopus. 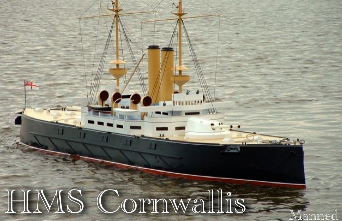 A third, but larger model, HMS Cornwallis followed in 2005 incorporating all I had learnt from the previous model and, best of all, room for a Captain and his Gun operator. A bespoke trailer was also built which had to double up as a launching / recovery device. I now have a glorious Wendy house on the water, which everybody admires and cannot believe that it is not radio controlled let alone that there are people inside. It is going to be very hard to go back to conventional models!